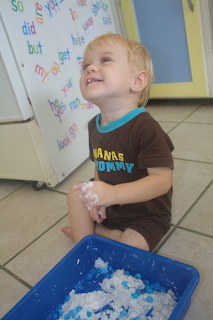 Last time we were at the library Eli picked out "The Little Cloud" by Eric Carle. He enjoys the bright colored pictures in Eric Carle's books, and this was no exception. 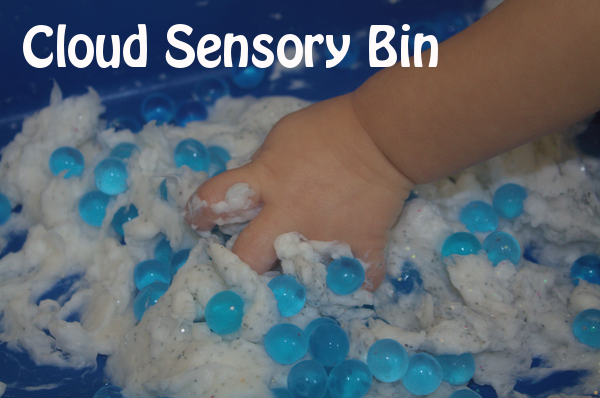 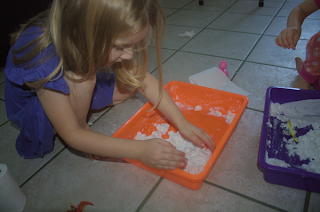 Since I am really just getting into the sensory bin thing for him, I decided to make one based on clouds. I couldn't find a whole lot of ideas online. 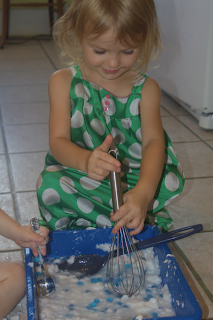 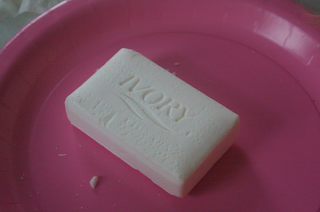 But I did find a fun addition to the normal Ivory soap cloud on Play at Home Mom. 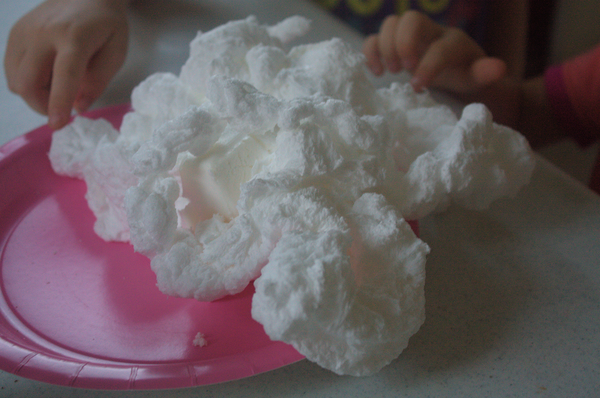 The girls and I played with an Ivory soap cloud before, and Bria remembered that it got big and fluffy when we microwaved it (Messy, Messy). 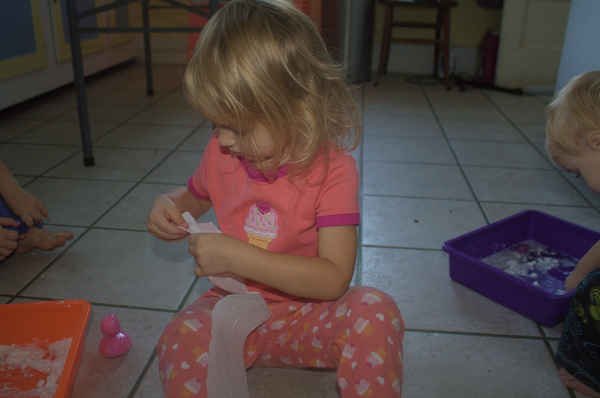 I originally meant for this to be for Eli, but the girls enjoyed it too. I had them find things that fly in the sky before we started. If you have seen Cars 2 you know that Holly (the purple car) flies (one of Nadia's choices). 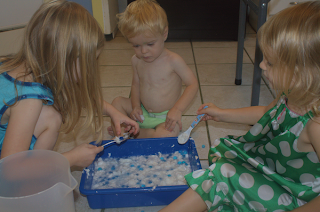 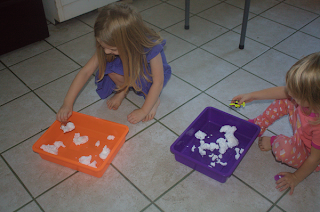 Then we microwaved our soap for 2 minutes. .
Of course they wanted to add water which made a very soapy mess. 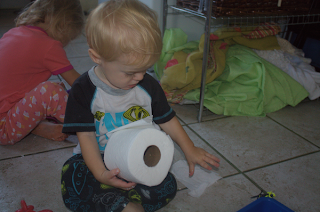 Then we added toilet paper to thicken it up again. 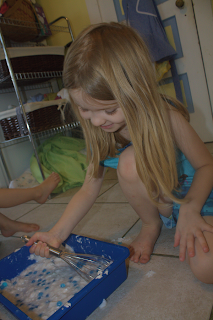 This is where the girls decided it was not so much fun anymore. 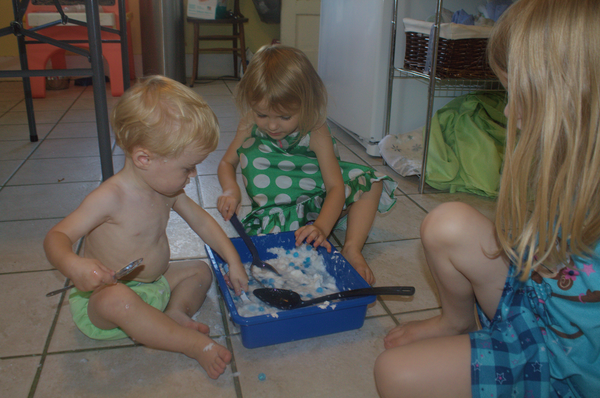 They thought it was going to get them all messy! 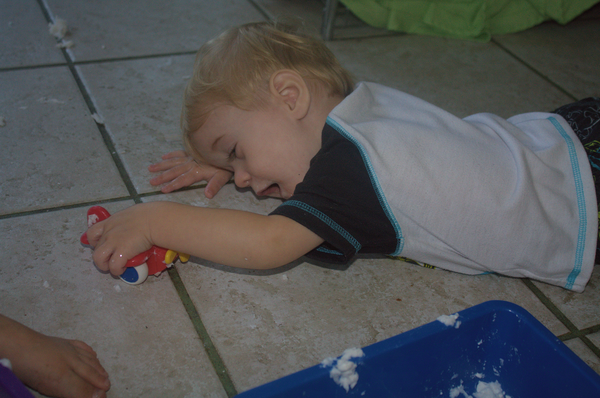 Explaining it was soap didn't seem to help them either. 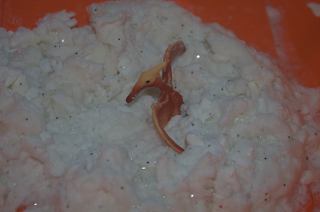 Eli still had a great time flinging it all over the kitchen. 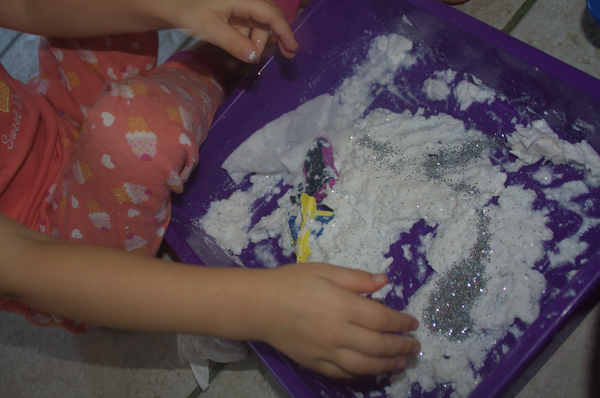 We added some glitter which got the girls a little more into it, but not as much as I expected. There was a little glitter accident while I was helping one of the girls. 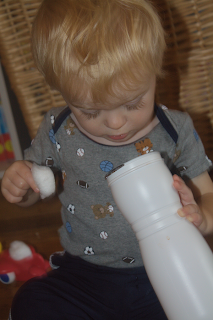 Apparently the lid did not get shut, and Eli found it! 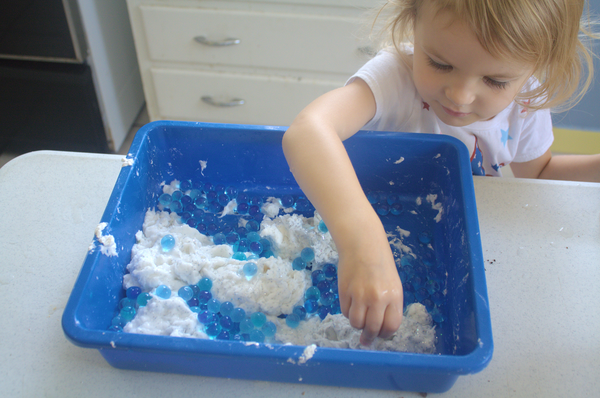 So a little while later I added blue water beads to act as rain. 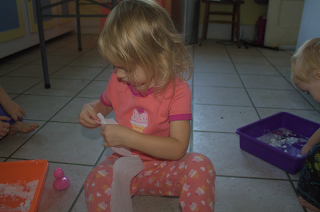 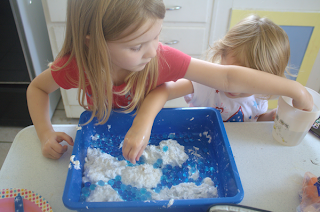 The girls enjoyed adding water beads, but still didn't want to play with it. Again Eli had a great time flinging it everywhere! 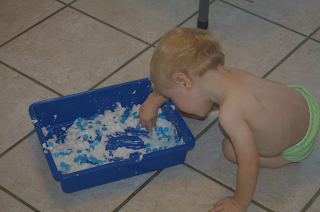 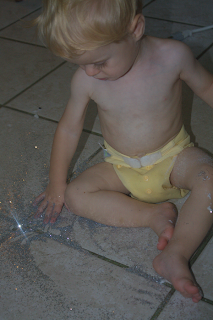 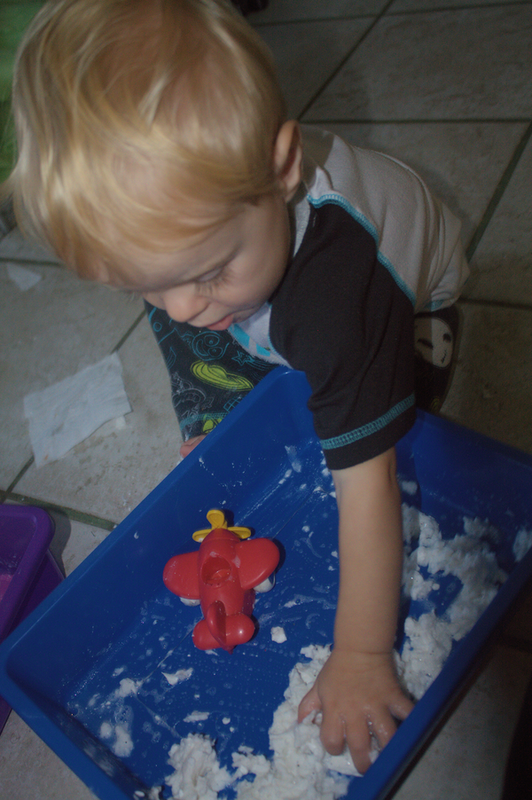 He really enjoyed trying to get the water beads out of the slippery soap. The next morning, I let them try again. This time I told them they could add more water. 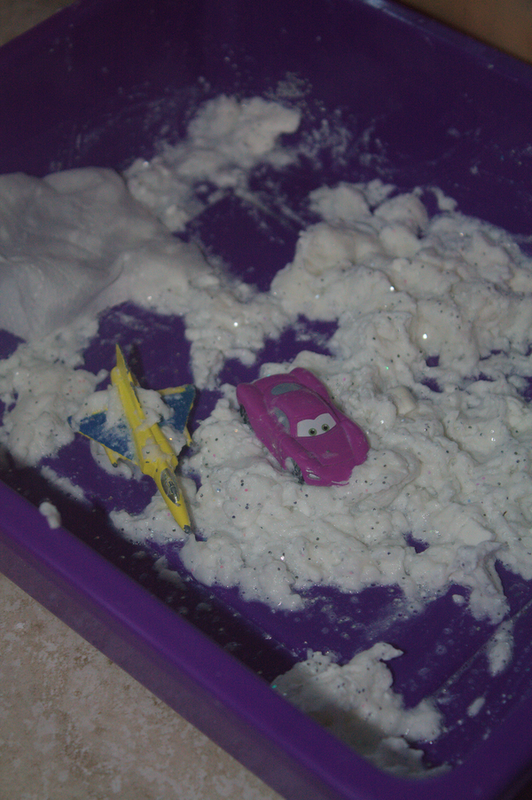 Somehow this and the addition of spoons made the entire activity way better! 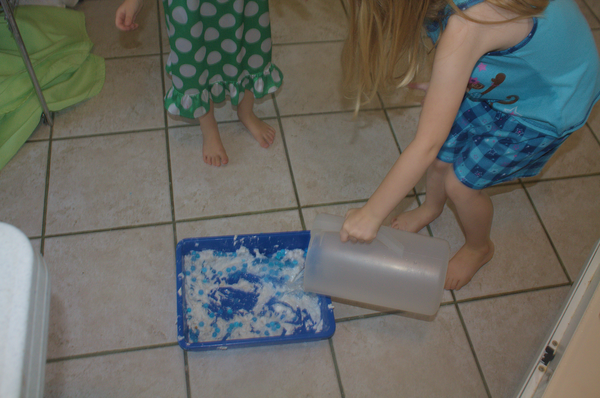 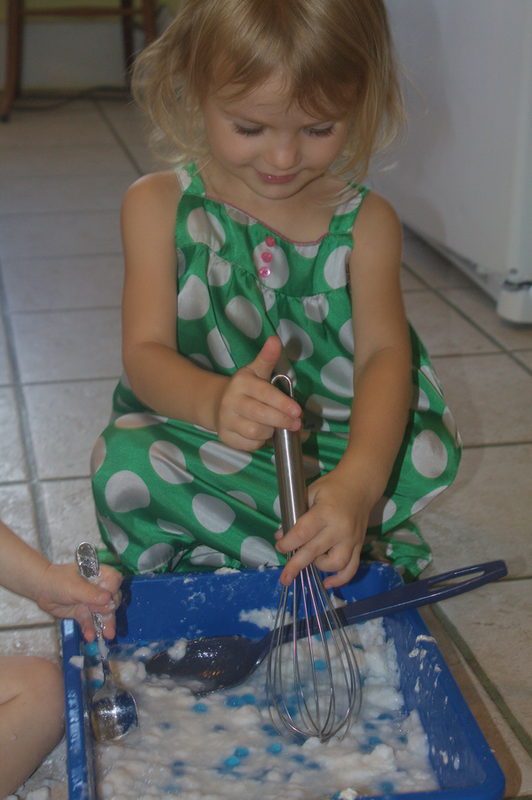 The stirred and whisked the soapy water and then splashed and rubbed soap all over their legs. 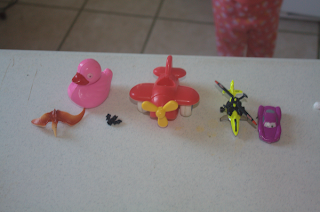 Then everyone needed a bath! 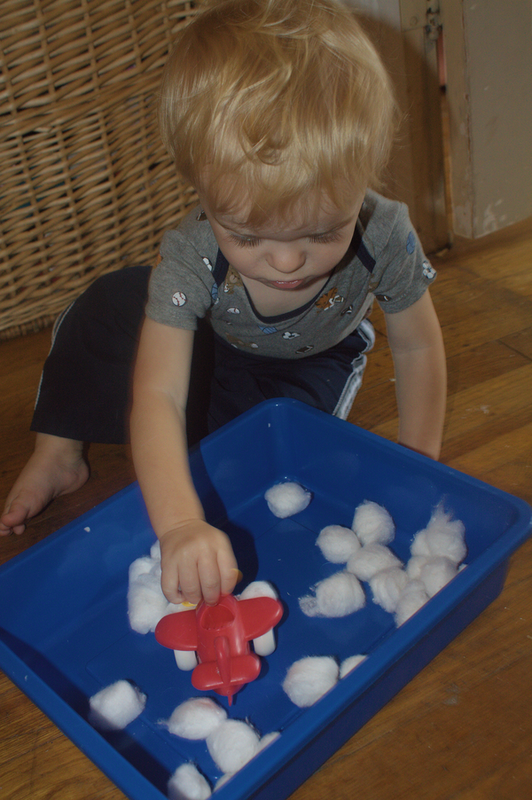 After everyone (and everything) was cleaned up, I made Eli a new little sensory bin with just some plain old cotton balls. 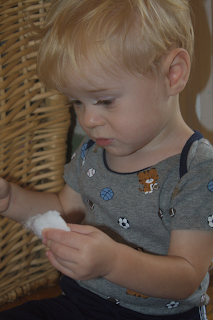 He loved ripping the cotton balls. 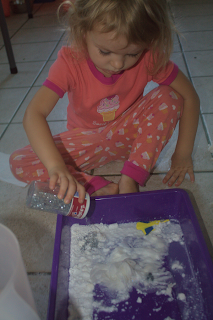 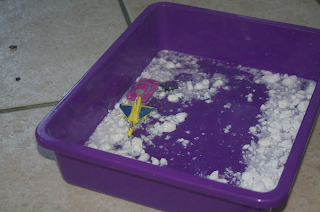 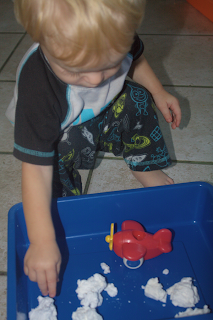 I noticed him sticking the cotton balls in his little plane, so I gave him a container to put them in. 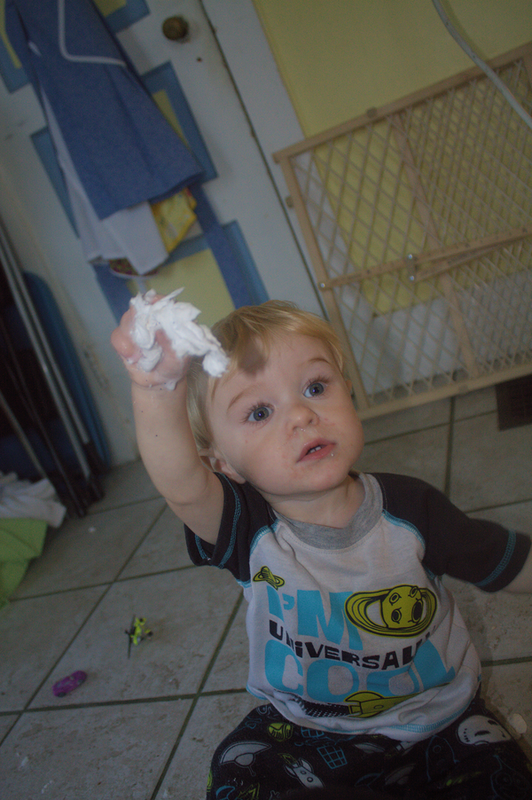 He loved sticking them in and getting them out again. He also enjoyed carrying as many as he could over to me and expecting me to keep them all in my hands. If one fell he would fuss a bit and then pick it up and stick it back in my hands.